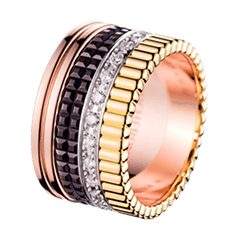 The Maison only selects diamonds whose color is superior or equal to the G grade. As for clarity, a Boucheron diamond presents a minimum grade of VS, meaning it has no inclusions visible to the human eye. The gemologists at Maison Boucheron choose each diamond with the utmost care. The four criteria for selection, named the “4Cs” (cut, color, carat, clarity) are used to judge the quality of Boucheron stones. Diamonds are selected among those with D, E, F and G color and IF to VS2 clarity. 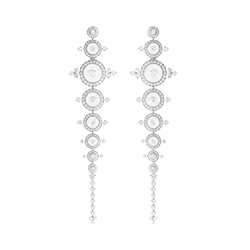 Moreover, the Maison Boucheron cuts the stones in the best possible way so as to offer diamonds that are sparkling and luminous. Because each diamond is unique, like its wearer, each center stone in the Maison Boucheron Bridal collection that is over 0.20 carats is certified by the GIA (Gemological Institute of America). 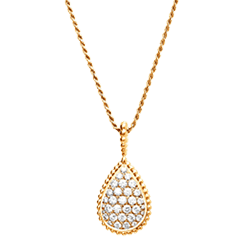 Sought after and admired, the diamond is outstanding in its rareness and exceptional sparkle. 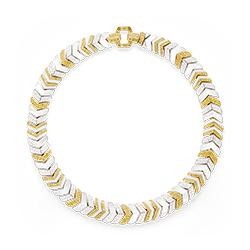 A symbol of purity, said to be invincible, it evokes eternal love above all. 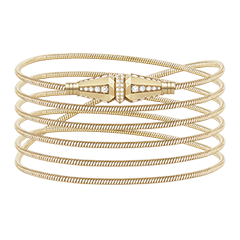 A timeless stone, the diamond never goes out of style. This crystal, made of carbon, is defined by the four major “4C” criteria: these play an essential role in measuring the quality of the gemstone. A diamond’s cut is chosen according to the stone’s original shape, its dimensions and inclusions. The diamond is cut so that its flat and polished facets are inclined at the best possible angle to reflect the light and give the stone its maximum sparkle and brilliance. The round brilliant cut is the classic shape for the engagement diamond. But there are other cuts, each with its own character: the marquise, the oval, the pear, the emerald and the heart cut. Apart from the heart and emerald cut, all the other shapes have 58 facets. These cuts have been designed so as to maximize the reflection of light on the stone’s facets: this way, the diamond shines and sparkles at its best. Clarity defines the capacity of light to shine through a stone without any impediment or obstacle. To evaluate a diamond’s clarity, one has to define the number and position of the stone’s inclusions. Inclusions are structural elements that have occurred during the stone’s formation and affect its homogeneity. 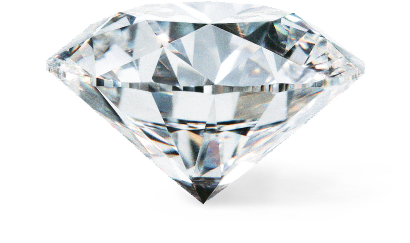 They come in the shape of a crystal or solid body, a dot or cloud…Diamond clarity is graded thanks to an international classification that ranges from IF to SI. FL-IF: Flawless or Internally Flawless. No internal inclusions. VS1 - VS2: Very Small inclusions. Can be seen under 10x magnification and in some cases to naked eye. I1-I2-I3: Imperfect. Inclusions are visible under 10x magnification and in most cases to the naked eye. The color of a diamond is measured by an international grading system defined by the Gemological Institute of America and ranging from D to Z. A D color diamond is perfectly colorless whereas a Z color diamond is slightly yellow, making it dull and lifeless. 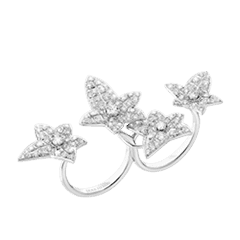 The diamonds selected by the Maison are of the most exceptional quality: they are between D and G for dazzling sparkle. Although white is the most frequent, there are over 300 different colors of diamonds: these are called “fancy” diamonds. It is thought that there is one fancy color diamond for every 10000th near colorless diamond: as they are very rare, these diamonds are considered to be miracles of Nature and are extremely sought after. the three criteria described beforehand must also be taken into account. A diamond of superior quality can be any size. 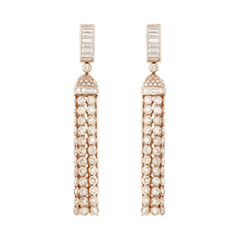 The Maison Boucheron is committed to offering the most exceptional stones and the finest quality diamonds to its clients. But the true value of a diamond lies above all in the emotional strength it carries within it when it becomes a gift and a pledge of eternal love between two souls. 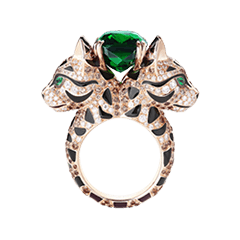 Ever since 1858, kings, princes, maharajahs and any man moved by love have asked the Maison Boucheron to provide the jewelry sets, the gems and rings destined to thrill and adorn their betrothed. Today, nothing has changed: the Place Vendôme and the Maison Boucheron continue to sparkle in the blaze of diamonds. Paris, the eternal city of love. 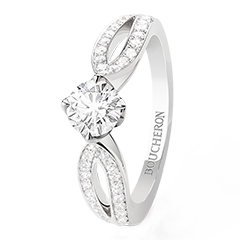 Boucheron, the eternal jeweler of style and emotion.